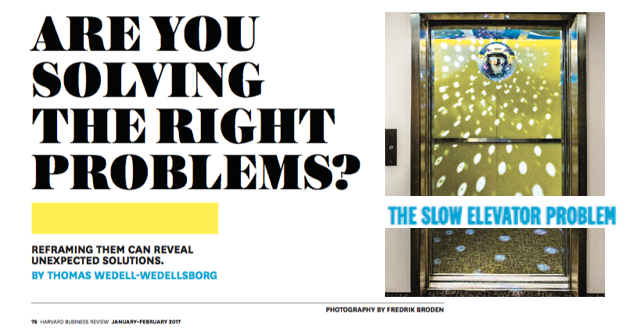 Thomas WEDELL-WEDELLSBORG wrote an inspiring article in the latest issue of Harvard Business Review : « Are you solving the right problem ? » points out that reframing them can reveal unexpected solutions, and greatly help managers solve their teams problems. First example : the ‘slow elevator issue’ where people complain about a slow elevator in their corporate building. The usual solutions go to having a quicker elevator. But the author another way to stop people complaining : putting mirrors into the elevators and the halls ! So that people are not sorry to wait anymore, while looking at themselves waiting in the mirror 🙂 Strange, ins’t it ? Another example shared is ‘America’s dog adoption problem’ : too many dogs are abandoned for the animal care associations to embrace … So what should they do ? The ‘usual’ solutions go for raising more money for shelters, more advertising to persuade people to adopt the abandoned animals, etc. All this is ok. But do you see another way to solve the problem ? Meaning, another way to put the problem ?! What is the real objective : To care for abandoned animals ? To make them adopted ? To find them new families ? … But they DID already have a family ! Thad decided to abandon them … A study on why do people abandon animals showed a surprising result : a large part of the former families of dogs DID NOT want to abandon them ! But were forced to do so because they could not afford to care for their dog, very often when it is ill : veterinary costs are high and not covered by health insurance, or when they had to move to a place not fitted for dogs. So the optimal solution is to work at that level : help people NOT abandon their animal ! By offering healthcare for dogs, or temporary shelter. This costed much less then the other options, and helped dogs as well as families to stay together. The Value(s) mindset becomes a real ‘problem solving’ methodology, applicable to any issue. Let me now share a more personal anecdote : I was 2 weeks ago in Moscow Aviation Institute to train Russian aerospace and shipbuilding engineers to the Value(s) method. I read the HBR article presented here in the airport before on boarding, and decided to later write this post. After the 1st day of training where we focused on the Value(s) mindset, Andreï, one of the Sukhoï engineers came to me. 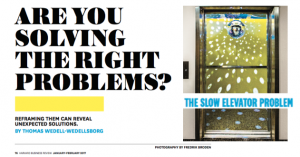 All this reminded him of a MAI professor 20 years ago, who told them to take care before starting to design anything, and used a nice example he never forgot : « the slow elevator problem » !!! Incredible, isn’t it ? (of course I had not mentioned my reading during the training). After all, Russians also launched the first sputnik, the first dog in space, the first man in space ! 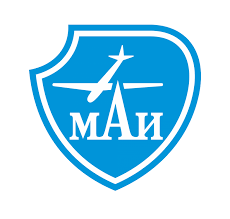 And all these came from the MAI – Moscow Aviation Institute ! The MAI dean Mr Bogosyan proved it by showing me their R&D workshops : who else put his hand on a REAL sputnik, a REAL soyuz capsule just returned from its landing in Kazakhstan, a REAL lunar module (well, this one did not make the return trip …). Very nice experience for me ! Article précédent : Valeur(s) d’une chemise ? Et des boutons de manchette ?